This publication contains King James Bible (1611, Pure Cambridge Version) (The Old Testament and The New Testament) translation. It holds 2 dictionaries. It has 1,596,239 references and shows 3 formats of The Bible. It includes King James Bible (The Old Testament and The New Testament) formatted in a read and navigation friendly format, or the Navi-format for short. Then it includes King James Bible (The Old Testament and The New Testament) coupled with 393,828 Cross References from the open source project at OpenBible.info. And the Cross References are not just a reference, but includes the full copy of the referenced verse in place. This is important if it is to be of practical usage, but it also means the size of this format is substantially larger than the standard King James Bible. It includes the King James Strongs Bible (The Old Testament and The New Testament) where every word is linked to the original in The Strongs Concordance. The Hebrew in The Old Testament. The Greek in The New Testament. We have included the gematria calculations to the Hebrew words. For the Greek Strongs the gematria is also calculated. Niqquds in Hebrew is not supported in this ebook. Most of the verses in the Bible formats are interlinked, so switching from one format to the other is usually only a click away. Hebrew Strongs Concordance; There are 8674 Hebrew root words as used in the Old Testament, part of the Strong's Concordance, an index of every word in the King James Version. 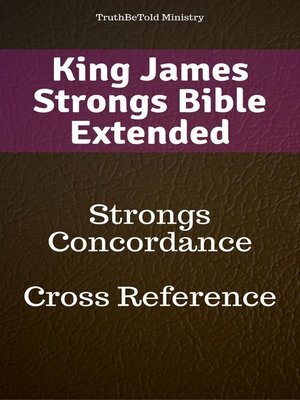 Greek Strong's Concordance; There are 5523 Greek root words as used in NT and Part of the Strong's Concordance, an index of every word in the King James Version. We believe we have built one of the best if not the best navigation there is to be found in an ebook such as this! It puts any verse at your fingertips and is perfect for the quick lookup. And the combination of King James Bible, the dictionaries, the concordance and its navigation makes this ebook unique.